Raghavendra Swamiji was born in Kerala.This Yoga and Ayurvedic Guru treated more than 3 million people for various diseases through his Ayurvedic medicines and Yoga without any operations. 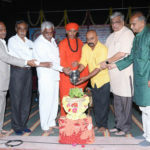 He constructed an Ayurvedic hospital at Malladihalli, Vishwa Yoga Mandir (World Yoga Trust) and various Educational institutions on a non-profit basis. His main concern was to educate the poor people and teach Yoga to all cross sections of the society for maintaining good health. He always says “You should not exhibit Yoga”, in other words, Yoga is not for exhibition purposes or competition purposes. 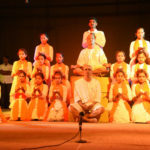 Based on his 70 years of experience in Yoga and Ayurveda and his various theories in Yoga teaching as per him, the number of Yoga postures is equal to the number of animals and birds living in the world. 12. ಶ್ರೀ ವೀರಾಂಜನೇಯ ಪ್ರೌಢಶಾಲೆ, ಶೆಟ್ಟಿಹಳ್ಳಿ ಶಿಕಾರಿಪುರ ತಾ. ಶಿವಮೊಗ್ಗ ಜಿಲ್ಲೆ. 13. ಶ್ರೀ ಅರುಣೋದಯ ಪ್ರೌಢಶಾಲೆ, ದುಮ್ಮಿ ಹೊಳಲ್ಕೆರೆ ತಾ. ಚಿತ್ರದುರ್ಗ ಜಿಲ್ಲೆ.